Weight increases. It’s a question you’re bound to have if you ever take up weight lifting, strength training, or resistance training. Whatever you want to call it, they all (roughly) mean the same thing. How should you go about weight increases? By a percentage? By a specific number? Does it differ from exercise to exercise? Muscle group to muscle group? Does your equipment matter? Does your experience matter? Should you do it during a training session? Or not? From training session to training session it’s a given — or at least it should be — that you have to increase the weights you use over time. This is what we mean by ‘progressive’ resistance training. The weights need to get progressively heavier or you have to be able to do progressively more reps with the same weight. The weight increases from training session to training session. The latter is more associated with muscular endurance than strength so it follows a somewhat different set of rules. Progressive resistance training means progressing in some way shape or form. i.e. weight increases. If you’re limited in your ability to add load/weight to any given movement then you’ll likely want to chase more reps each and every time you train. This improves muscular endurance. So long as you train near absolute failure and the load stays above 40% of your one repetition maximum (1RM) you could also increase muscle growth (hypertrophy) to some extent. 1RM is the maximum amount of weight you could lift one time. Muscular endurance is worth chasing once and awhile, but it’s not typically where I’d put my focus if I were you. If you’re an intermediate or advanced trainee; Try it once or twice a year. Outside of that occasional challenge to improve fatigue resistance the only time I’d recommend it is; If it’s your only option. Let’s say you only have one 20 kg weight or one 25 lbs weight and you don’t have many options. If it’s better than nothing, then it’s worth doing. I’d still save some dough and make some equipment purchases as you progress, but it’s a fine starting point if you don’t have much equipment. Weight increases will serve you better in the long run, than rep increases, though both are sometimes needed. Assuming you want to take lifting somewhat seriously then weight increases to the bar, bell, machine, whatever piece of equipment you’re using is the name of the game. I’ll write a separate article up on how I’d recommend weight increases in-session. Meaning how you might manipulate the weight you use once you’ve already started. That in my view may actually be more important, because it’s a mini-experiment every time. What gets lost on most people is the cyclical nature of training. This isn’t an article on that, so let’s talk strictly about one phase of training. A ‘phase’ is about a month or so of programming (2–8 weeks) and the technical term is a macrocycle. In other words, how should your weight increases happen from workout to workout, before the workouts change? Today’s article will be specific to the weight increases I think you should make from training session to training session. Excluding different days of training. If you’re doing Day 1 of 2x2 training, and then doing it again, this is roughly how I’d recommend the weight increases. You need to factor these things into your approach and you need to individualize your approach. Your main consideration should be an assessment of what equipment you have and intend to use. It’s your biggest limitation and the most practical consideration. For instance if you’re training at home and you only have a pair of powerblocks or adjustable dumbbells you likely can only make weight increases in 5 lbs or 2.5 lbs (if you’re lucky) jumps. Most kettlebells only have weight increases of 4 kg (8.8 lbs), though you can find more and more these days that jump 2 kg (4.4 lbs). That would add cost to a home gym. If you make the leap and purchase a power-rack and a barbell for home use. The majority of the time your first plate package purchase will only come with 2x10 lbs, 2x25 lbs and 2x45 lbs plates. That means your minimum weight increases are 20 lbs (9 kg). 20 lbs is a big weight increase for a single leg lift but they might not be that big at first for double leg (bilateral) squats and deadlifts. Smaller micro-plates do exist, both for dumbbells and barbells but micro-loading — lets say anything less than 5 lbs or 2kg — won’t be absolutely necessary until you’re closer to being an intermediate lifter. Machines typically make it easier to manipulate load. However, not all machines have universal weight increases. Machines vary from brand to brand and from machine to machine, depending on levers. Few people who aren’t in gyms will have access to them which is why I put them last. Good rule of thumb is to try to do your minimum accessible weight increase every time you train. Meaning, most of the time you’re going to try and do 5 lbs more on a dumbbell, or 4 kg more on a kettlebell*, or 20 lbs more on a barbell. Whatever your equipment access dictates. If you have access to smaller weight increases, awesome, this will help you as you become more advanced. If you find those bumps easy on your first or second work set in any given training session, you can always add more. Be conservative on set 1 and add weight accordingly. The weight increases will eventually become too big, depending on the lift you’re doing. When this is the case, you can briefly switch tactics to shooting for increased reps rather than increased load. Once you’ve increased your reps by about 2–4 reps over the number your program shoots for; Attempt a weight bump again. i.e. If your program is 3 sets of 8, if you can get to 10 with the same weight, try to bump the weight up. You can shift gears like this back and forth quite successfully but you’ll eventually stall with weight increases. Once you stall (depending on your objectives) on your most important lifts you’ll likely want to switch the program up (to a new ‘phase’). *Kettlebells may have a slightly unique approach but it’s only applicable if you subscribe to a ‘hardstyle’ approach, which I generally do. Progress here can be an outlier. You cannot apply jumps from one piece of equipment to another piece of equipment. Kettlebells are most often in kilograms. They are also more often in 4 kg jumps (8.8 lbs). Barbells will typically have even larger minimum jumps unless you invest in micro-plates. Machine to Machine will have different levers and different weight stacks. A smith machine is not the same as a barbell even though they look similar. If you are forced to make a last-minute change to your routine at a gym don’t assume that you can make the same weight increases as before. i.e. someone is using the machine or piece of equipment you used last time and you’re making a modification or your new gym doesn’t have what the old gym had. I only tell you this because a common mistake I see with people loading is that they try to universally apply the same jumps to all equipment. They get overly ambitious with the weight increases and then make mistakes. Treat a new piece of equipment or modification to an exercise with a conservative attitude. Treat it like it’s your first time, even if it’s similar. It’s possible you can lift more or bump more on a new piece of equipment but it’s best to work up gradually and test the waters. I’ll discuss that in a separate article on ramping up load in a training session. If you’re a beginner you can make far bigger jumps than more intermediate or advanced trainees. If you’re brand spanking new to the concept of lifting, you have even more room for growth than someone who has made a few attempts in the past. It’s the nature of being new and having a lot of room for improvement. The jumps you can make as you progress will get smaller and smaller. For example, a clients very first session with me for the deadlift may only yield a 65 lbs (30 kg) deadlift attempt for a woman and maybe a 95 lbs (40 kg) deadlift attempt if you’re a dude. Now it’s possible that you could have started with more, but it’s your first session and we want to groove some technique. Your second session could easily be bumped up to 95 lbs and 135 lbs respectively (maybe even more). A 30 lbs in one case and a 40 lbs jump in the other, for a 46% jump or 42% jump respectively. It highlights a main consideration; the more skilled you are, the smaller the jumps become. Even if the weight you increase by is greater, the percentage improvement becomes smaller because the numbers you’re working with are greater. This is why a specific percentage recommended increase can’t work and you’re better off focusing on rough increases based on your access to equipment. Let’s tie this back to a more experienced intermediate lifter using the same lift. I recently did a phase with a client who had a previous personal best (PB) of 315 lbs for 3 reps. I designed a phase of programming with the objective of moving them past this previous personal record (PR). The specifics of which I won’t get into (lots of support/accessory work). Based on my experience, 320 or 325 seemed possible as a new PR or PB — these terms can be used interchangeably. These are the types of improvements you start shooting for when you’re lifting almost twice your bodyweight. You can see we started the training phase about 15% (13% to be exact) below, but we used the first session to assess where current strength was in the lift. *When you haven’t been doing an exact lift with a similar rep range (i.e. intensity) you can decondition to a certain extent. Depending on how similar other exercises are in your previous programs or how long it’s been since you trained a specific movement. It is sometimes possible that after a PB, some time off yields a supercompensation pattern pretty quickly and you can hit a new PB in the next phase (i.e. 4 weeks later). From there we’re just trying to make small improvements. Maybe 5–10 lbs each training session, sometimes it’s even smaller. We’re using each set as the opportunity to observe what jumps we can make. After two weeks you can see they took a bit of a step back. They stalled around 275–285, partly due to life stress at the time (work). Each week we maybe bump the number of the previous week up by 1–3%. However, we had to make many adjustments on a session-by-session basis. You’re not a machine and the linear gains a beginner may see will not last to this level. After four weeks of training, we hit a PB but it’s only a 3% improvement over their previous PB. An intermediate needed a whole phase of training just to get 3% improvement. While the beginner made 46% or 42% in a single session. As beginners continue to improve, you’re going to see the percentage of improvement drop to the levels you see in the latter example. Beginners will set PB’s nearly every session, but intermediates and advanced people will have to back off and rebuild to set new PB’s with smart training. I wanted you to see the intermediate example, so you can see how nuanced it is. It takes practice to figure out an approach that works for you. 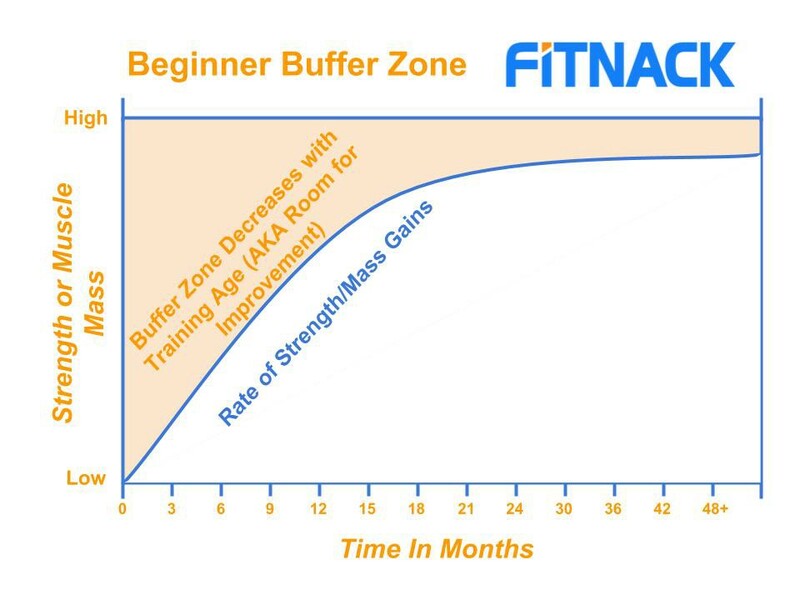 If you are brand new to training you likely have a huge buffer for improvement and will make large strides quickly. That being said, you also need to be mindful of how large the jumps actually are relative to ability. A 5 lbs jump on a dumbbell press, when your current ability is only 10 lbs, is a 50% jump. If your current ability is 40 lbs, a 5 lbs jump is only a 12.5% jump. Not that big a jump for a beginner. Using a universal percentage jump isn’t practical because you’ll be limited by your equipment access. The two examples above, used the same absolute load increase (5 lbs) but the percentage increase is dramatically different. Percentages are useful for formulating a lifting strategy. If the absolute change will be a huge percentage increase, you may be better off trying an increased rep strategy, before you bump the load up. If you’re supposed to do 3 sets of 8 with 10 lbs; You may be better off trying to do 3 sets of 10 or 12 before you make an attempt on 15 lbs. Even then, because it’s such a big jump, you may have to make some concessions. Meaning because the jump is so big, you may have to go to 3 sets of 5 or 6 with 15 lbs first and then again work your reps up to 8 (your target). Confusing, I know, but one of the nuances of training that people miss. The other strategy you may want to take is to find a way to increase load more gradually. i.e. a 2 lbs or 2.5 lbs increase on 10 lbs, is only a 20–25% increase in load. I’ve had some success with people purchasing small ankle/wrist weights for this (1–2 lbs, or 0.5–1kg). It’s a cheap way to add smaller loads on your way to a bigger percentage jump. There is a double-edged sword at play in this regard. As a beginner your initially large jumps may not be easy to execute at first. This means that your initial strategy may need to be more like that of an intermediate person. Small jumps if possible, or rep improvements before weight improvements. Sometimes the jumps for a beginner are in fact, way too big. I just don’t want everyone to have the impression that huge strides for beginners are always possible. This is more pronounced in women. Especially upper body training for women. It’s not that often I come across a first time male trainee who maxes out at a 10 lbs dumbbell press, but I’ve seen it many times training women. No offence ladies, you’re not soft, or weak. You just don’t typically have the shoulder musculature and structure that men do. Of course, size is also a contributor. Small men or women will have lower starting points than larger men or women. Women are generally smaller than men so you see this reflected in absolute numbers. Kilo for kilo though the differences become smaller. The differences are not as pronounced in lower body training. Pound for pound, women can usually hang with men on lower body exercises. It’s just the upper body that can and is a limiting factor for women relative to men. That includes grip. In the example above, where the minimum jump possible is just massive (50%) it’s usually only a factor I’ve seen play out with women and usually only with upper body training. As a result the beginner micro-loading strategy is more applicable to women. Not always, but usually. Let’s go back to the deadlift example above. It’s a closed chain compound movement. Meaning your feet are on the floor, and the weight is being moved around the floor. You need to balance the load and your body. You need more coordination. It’s not the most technical thing a person could do in the gym, but it’s a lot more complex than a leg press. A leg press takes the upper body and grip completely out of the equation, so you often see massive weight increases on this machine. The machine stabilizes the weight so less coordination is needed. Due to the increased stability you can be a little more aggressive in your loading on the leg press. Mostly because of a lowered neurological/ coordination requirement and an increase in prime mover (the biggest muscles involved) activity. When small muscles don’t have to stabilize in a more technical compound movement, they don’t become the limiting factor for weight increases. Your first session on a machine would likely yield a result closer to your true strength potential because the neurological demands are lower. You can basically cut through the problem of learning the movement and get right to the strength development. An advantage of machine training. That’s why I’ve been able to do over 900 lbs on a leg press, but not much more than 405 lbs on a deadlift. There is no major stability or balance requirement, the machine is doing most of that work for you there. This is often an argument against machine training, but that’s off-topic. The more technical a lift, the greater the need to learn correct technique and the slower the progress will be with load. Likewise if we compared a regular deadlift to a single leg deadlift we increase the stability demands even further. By extension this does increase the technical demand but I also wanted to highlight how balance/stability influences load increases. The more balance or stability that is required, the smaller the jumps will be. An EZ bar or barbell curl can use bigger jumps than a dumbbell curl. A dumbbell lunge will use smaller jumps than a barbell lunge. Smaller muscle groups become the limiting factor when the stability and balance demands increase. This should factor into how large your increases are from workout to workout. Your bumps need to be specific to the exercise in question. Let’s keep rolling with the deadlift example. Above I compared it to a leg press. An exercise similar to a deadlift, still a multi-joint compound movement (hips and legs flex) but with far less stability required. The leg press also has none of the upper body limitations that the deadlift has like grip or torso strength (often huge limiting factors for the deadlift). Let’s take it a step further and go to a machine leg curl. The leg curl is more of an isolation exercise, so even less coordination than the leg press. It’s one joint moving, versus two in the leg press. That means more stress onto a smaller muscle group, the hamstrings/gastrocnemius and likely some long adductors like adductor magnus. Like the leg press there is no stability requirement, but fewer muscles are being trained. What happens to the load you can use? Right, weight increases go down. Unlike the leg press example above. Whenever we put more stress onto a smaller muscle group, the weight jumps have to get smaller. A chin up or lat-pulldown may facilitate large bumps in additional load from training session to training session. However, the moment we try to stress the lats more directly with a straight arm pulldown, or the brachialis (arm flexors) more directly with a curl, the load jumps have to decrease. It’s proportionate too. Wrist flexion or extension are very small muscle groups, they’ll have very small jumps. Upper arm muscles are a little bigger, so they can have slightly larger jumps. The larger muscles of the back like the lats are a little bigger, so they can have slightly larger jumps. If the load is spread onto more muscle (as in a compound multi-joint exercise) then the jumps can be larger. If they are isolated to smaller muscles with limited action (isolation exercises) then the jumps have to be smaller. In the four-hour body, Tim Ferriss alluded to learning how to deadlift 400 lbs in a fairly quick time frame. What he didn’t really clarify was the context of how he got there. He shortened the range of the deadlift and only lifting the bar 4" off the ground, which is a lot different than lifting it to lock out. Basically the reverse of what you’ll see below. The elevated deadlift yielded a the top range of motion for 4" or so to lock out. Not exactly the same, but a similar effect. Whenever you decrease the range of motion of an exercise your weight increases are bumped up immediately. By extension you can increase the jumps from training session to training session. If I elevate the starting point of a deadlift with a 12" box as I’ve done here. I effectively shorten the range of motion from my other deadlift example above by twelve inches. *Go back and look at the difference in my positioning. That’s a lot less range of motion to get through and as a result I can instantly handle substantially more weight from the get go. Shortening the range of a movement with partial ranges also means you make bigger jumps from training session to training session. Now this can be a great way to learn a new movement or train through a sticking point but it can also give you a false sense of superiority. I see this often at the gym, where people will load up 300 lbs or 400 lbs for a squat and then they quarter squat it (only go through the top quarter of full range of motion in the squat). Then they tell people around them that they can squat 300 lbs, when really they need a qualifier. They can quarter squat 300 lbs. I’m not saying this because I think it’s wrong to train with partial ranges of motion. They have their place. I’m saying that sometimes numbers can be misleading if you don’t have the full picture. Almost everyone is stronger on the internet than they are in real life. Lastly I just want to bring up day-to-day factors that influence weight increases. This is another highly nuanced skill that people have to develop to make their time spent in the gym more effective. You need to have an honest conversation with yourself before each and every training session. What are your energy levels? How well did you fuel? What are your stress levels like? If you slept like crap and have been making steady 10 lbs jumps on good sleep, you may want to adjust down. You may even want to shoot for less than what you did last week. To give your body an opportunity to maintain the strength it’s developed (get some training effect) but also give your body a bit of a break at a time when it may not be able to handle typical jumps. You can improve recovery outcomes by listening to your body, so that future training sessions are better. If you didn’t eat well before you trained, and you typically do, this is valuable qualitative information that should influence how you load today’s training session. If your mood or energy is low, adjust down. If you don’t feel great adjust down. If you’re really stressed, adjust down. You may even want to go to plan B as I call it with many of my clients or a recovery oriented workout (drop the volume, try to maintain the intensity as best you can). Every session is an opportunity for lifestyle factor damage control. You can minimize the training adaptation losses you’d otherwise face by adjusting your strategy. Some training, is better than no training, even if it’s lower than your typical bumps, or even negative bumps. Likewise you can move in the other direction. There is a bit of a yin and yang phenomenon to training. You’ll have opportunities where your energy, mood are off that charts. You slept like a baby, your nutrition is on point and everything is firing on all cylinders. This is your opportunity to consider bigger jumps than usual. For every mediocre training session you have, you’re likely to have an amazing one. You have to take the good with the bad because you’ll experience both at some point. When you feel good, like you can absolutely crush your training, go for it. Training, like life, is cyclical. You have to ride the highs and the lows. Weight increases are a nuanced subject. They can be influenced by a large number of considerations. This is part of what makes them complicated for beginners. Beginners like definitive answers. Black and white. So little of training is black and white though, you’ll get more out of the process by learning nuance. It’s also likely why many people tuned out part way through this large article. You know you missed something. I know you missed something. So bookmark this page and review each subheading on its own. There are some gems of practical advice in here if I do say so myself. Make learning easier on yourself by practicing each of the above nuanced considerations one at a time for a phase of programming. Try to figure out how it applies to you. If all else fails follow the golden rule based on equipment availability and make the minimum weight increases you can every time you train. If you can’t make a weight increase, try increasing the reps. Once you’ve increased your reps 2–4 reps above your target zone, try another weight increase at that point. Ideally chase weight increases on a phase to phase training basis above rep increases but rep increases can prove useful if you have limitations. I also like them as a challenge, once or twice a year. I just want you to know that there are times when even the minimal weight increases you have access to will be too much from time to time. Sometimes you may even handle larger weight increases than usual. Sadly, it is not black and white. There is no universally right and wrong way to do it, other than to see the weight increases go up over time. If you’re not making good progress with your resistance training, there is something in this article that may help explain why.